What does it cost to enter the State Recreation Area? At this time there is no entrance fee. Vehicles entering the State Recreation Area must meet requirements for Off-Highway vehicle use. See the OHV registration webpage for more information. What are the emission sound requirements on vehicle entering the State Recreation Area? For ATVs and ORVs the emission sound must be under 99 decibels. For OHMs, the emission sound must be under 96 decibels. The Stationary Sound Test found in the Motorcycle Industry Council manual is used at the State Recreation Area. Information on the test procedures. Does the State Recreation Area have a campground? Camping is available at many local campgrounds operated by local governments and private individuals. The City of Gilbert operates the Sherwood Forest campground, which is connected to the Recreation Area by an OHV trail. Does the State Recreation Area rent Off Highway Vehicles? OHV rentals are available from private business. The Iron Range Tourism Bureau has more information. What are the State Recreation Area hours of operation? Does the State Recreation Area have its own rules and regulations? 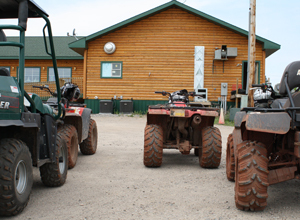 The State Recreation Area uses the same OHV rules and regulations that are used throughout the state of Minnesota. See the OHV regulation webpage for more information. Is there a OHV license or registration requirement for the vehicles entering the State Recreation Area? All vehicles entering the State Recreation Area are required to have OHV registration. OHV registration is available at local Department of Motor Vehicle offices, DNR License Center and at the State Recreation Area. During busy times at the State Recreation Area there may be a short waiting time for OHV registration sales. It is best to purchase an OHV registration before visiting the State Recreation Area. We recognize OHV registrations from other states. If your state does not have OHV registration you will have to purchase the Minnesota OHV registration. See the OHV registration webpage for more information. 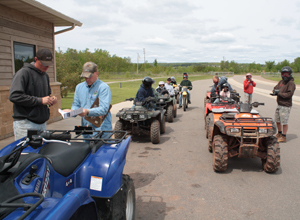 Non-residents must purchase a non-resident OHV trail pass unless operating vehicles already registered in Minnesota. Are there safety-training requirements for vehicle operators? Yes, the rules are the same at the State Recreation Area as throughout the state. See the OHV regulation webpage for more information. Are helmets required to enter the State Recreation Area? The helmet requirement is the same as anywhere in the state. Anyone under the age of eighteen must wear a DOT approved helmet. 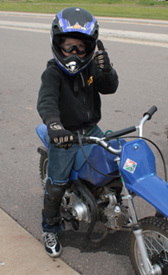 What are the age requirements for operating an OHV in the State Recreation Area? The rules are the same as on any public land in Minnesota. Any person under ten years old is not allowed to operate an ATV on public land. Rules for OHMs and ORVs are different. See the OHV regulation webpage for more information. What are the safety equipment requirements for OHV's entering the State Recreation Area? See the OHV regulation webpage for more information. Helmets are required for anyone under the age of eighteen entering the State Recreation Area on ATVs of OHMs. For ORVs, all passengers and operators must wear a seat belt. For OHMs, all operators must wear eye protection. Are there hotels or motels near the State Recreation Area? Are there other OHV trails in the area? There are many OHV trails within a one hour highway drive from the State Recreation Area. Find a trail. There is a National Forest ATV trail within a few minutes of a highway drive from the State Recreation Area known as Big Aspen Trail . Is there a place to get fuel for the OHVs? There are three businesses which sell fuel in nearby Gilbert. All are accessible by ATV trail. There are three restaurants in nearby Gilbert. Two serve meals all day and are accessible by ATV trail. Is there any business nearby that does repairs on OHVs? OHV repair service is very limited, especially on weekends. A few businesses are open on Saturday mornings.